Hitler's Third Reich is falling apart. The German people are being bombed, at every turn, by the Allies. In the east, Soviet troops are making great strides toward Berlin. The capital, itself, is endlessly bombed. Nearly everyone there realizes that the war is lost. When orders from Berlin direct Baden officials to blow-up their waterworks and public utilities, it seems like even the order-givers know the war was lost. Who would blow-up their own infrastructure if the country is safe from invaders? Against this backdrop, we catch-up with Albert Speer (Hitler's architect). He is on his way to Berlin to meet with Hitler. Before returning to Berlin, Speer took a last quick swing south, to Baden. He was in Heidelberg when the Berlin order came through to blow up every waterworks and public utility in Baden. He suggested that all these orders be dropped into a mailbox about to be overrun by American troops. On at least two occasions, Speer was driving and weaving his car between the advancing Americans and the retreating Germans. Only his knowledge of the backroads of the Odenwald, his childhood tramping grounds behind Heidelberg, saved him from capture. Hitler is meeting others before Speer arrives. 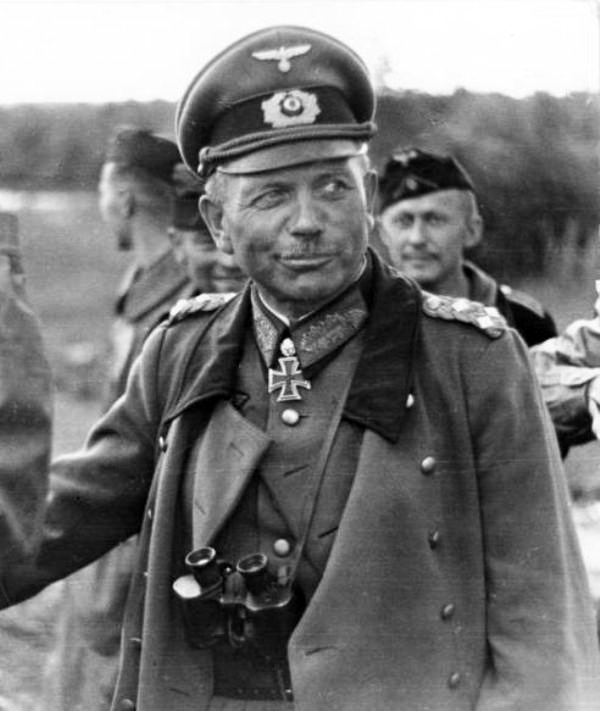 He dismisses those who believe nothing more can be done to save Germany from defeat, including General Heinz Guderian, Speer's ally. Now it is Speer's turn. Despite this knowledge about Speer, Hitler does not know everything about his colleague. There are things which would likely cause him to give an execution order. But Hitler does not know, so there is a chance Speer can live. Had the culprit been anyone else but Speer, the choice might well have been between shooting and hanging. Or if Hitler had got the least wind of suspicion of the poison-gas affair, it would have meant strangulation while suspended from a meathook. But the tension soon seemed to lessen. He merely said, calmly and rather matter-of-factly, "If you were not my architect, I would take the measures called for in such a case." The magic word had fallen, like an incantation. Speer was an architect, a creator, "ein Kuenstler." In the murderous game of one upmanship in the Hitler court, this and this alone is what Speer had going for him. This is what he had over the paladins and hierarchs, over Bormann, Goering, Goebbels, Himmler. In the Hitlerian vocabularly, there was simply no higher word of praise. Speer refused to flinch. "Take the measures you deem necessary and grant no consideration to me as an individual." Hitler countered, solicitously, "Speer, you are overworked and ill. I have therefore decided that you are to go on leave at once." They were the identical words he had spoken to Guderian, just a few hours earlier. "No, I am perfectly well," Speer replied. "If you no longer want me as your minister, dismiss me. I cannot keep the responsibility of a minister while another is acting in my place." At this point, and for the first time, Speer added the conciliatory note "I cannot, mein Fuehrer." As the conciliatory phrase fell, there was a lengthy, relaxing pause. The Fuehrer sat down. So did Speer, unasked, a real breach of established court etiquette. Now Hitler began again, this time almost pleading. "Speer, if you can convince yourself that the war is not lost, you can continue running your shop." The request was simple enough in its emptiness. It was a request for lip service, the real language of the unreal world of the bunker, the lingua franca of self-deceivers. Speer, too, had now taken his cue, and modulated his earlier tone of calm defiance. But he did not capitulate. He had often, in the past months, warned Hitler that he was surrounded with "nodding donkeys," so why should he, Speer, suddenly start to bray? Hitler would see through that. "You know I cannot be convinced of that. The war is lost, verloren." Verloren, the word Hitler just could not take. He launched into his broken-needed recitation, variations on the theme of never-say-die, Leonidas at Thermopylae, Horatius at the bridge, Frederick the Great in 1762, his own incarceration in Landsberg prison in 1923, the 1941 stand before Moscow, the 1942-1944 miracle production figures of Speer's own ministry. Speer is unmoved. What should he tell Hitler? How should he tell him? Should he use the strongest-possible words? He has already used Verloren...the one word which Hitler detests because it means the war is really and truly lost. ...I cannot, with the best will in the world. And after all, I do not want to be one of the swine in your entourage who tell you they believe in victory without believing in it." The strong word here is Schwein, much stronger in German than it sounds in English...But since it was not aimed directly at him, he let this irreverent slur pass. Hitler said, "Do you still HOPE for a successful continuation of the war, or is your faith shattered? If you could at least HOPE that we have not lost. You must certainly be able to HOPE. That would be enough to satisfy me." Speer still refused to answer. The bunker silence was not intense. It finally snapped Hitler, the pleader, back into the authoritarian tone with which this showdown session had begun. "Speer, you have twenty-four hours to think over your answer. Tomorrow let me know whether you HOPE the war can still be won." Speer returns to his flat and spends time thinking about his next move. He decides to write a long letter to Hitler, spelling out exactly why the war is lost. Hitler, however, anticipates this move. He has already ordered the secretaries to not type-up anything which Speer sends to them. He wants to see Speer personally. About twenty-four hours after Hitler dismissed him, Speer returns to the bunker. All the words he had written in his 24-page letter are now blurred in his head. What will he tell the Fuehrer? Without shaking hands - when Hitler was rude it was always intentional - the Fuehrer greeted him with one terse word: "Well?" "Main Fuehrer," Speer said, "I stand unreservedly behind you!" At first, this sounds like a capitulation. For the moment, the Fuehrer did not even answer. Then, slowly, he shook hands, his own hand trembling. His eyes welled up with tears of gratitude. "Then all is well." Speer has a plan for implementing Hitler's previously issued orders to destroy infrastructure. When he drafts the new document, which Hitler initials in pencil, Speer now has the authority to cripple installations, not destroy them. This clip is a recreated scene of events described in James O’Donnell’s book, The Bunker, between Hitler (played by Anthony Hopkins) and Speer (played by Richard Jordan, who died, in 1993, from brain cancer). The film, created for television in 1981, is also called “The Bunker.” It was aired by CBS that year. Following interviews with many witnesses, James O’Donnell wrote The Bunker (1978) which describes Hitler’s last days. One of his key contacts was Albert Speer, Hitler’s architect. Here is an unforgettable, graphic account of the final days in the Führer's headquarters, deep under the shattered city of Berlin as World War II in Europe drew to a close. From James P. O'Donnell's interviews with fifty eyewitnesses to the madness and carnage—everyone from Albert Speer to generals, staff officers, doctors, Hitler's personal pilot, telephone operators, and secretaries—emerges an account that historian Theodore H. White has hailed as "superb . . . quite simply the most accurate and terrifying account of the nightmare and its end I have ever read. To learn more about Speer, read his own memoirs (Inside the Third Reich, availble for online reading) and a highly respected work by Gitta Sereny (Albert Speer: His Battle with Truth). Clip from The Bunker, a 1981 CBS film now in release as a DVD by HBO. Copyright, HBO, all rights reserved. Clip provided here as fair use for educational purposes and to acquaint new viewers with the film. Bos, Carole "Hitler's Bunker - Recreating the End " AwesomeStories.com. Jul 14, 2014. Apr 19, 2019.